The S-02’s outstanding performance and unsurpassed clarity allow the listener not only to hear the music, but also to feel the music. 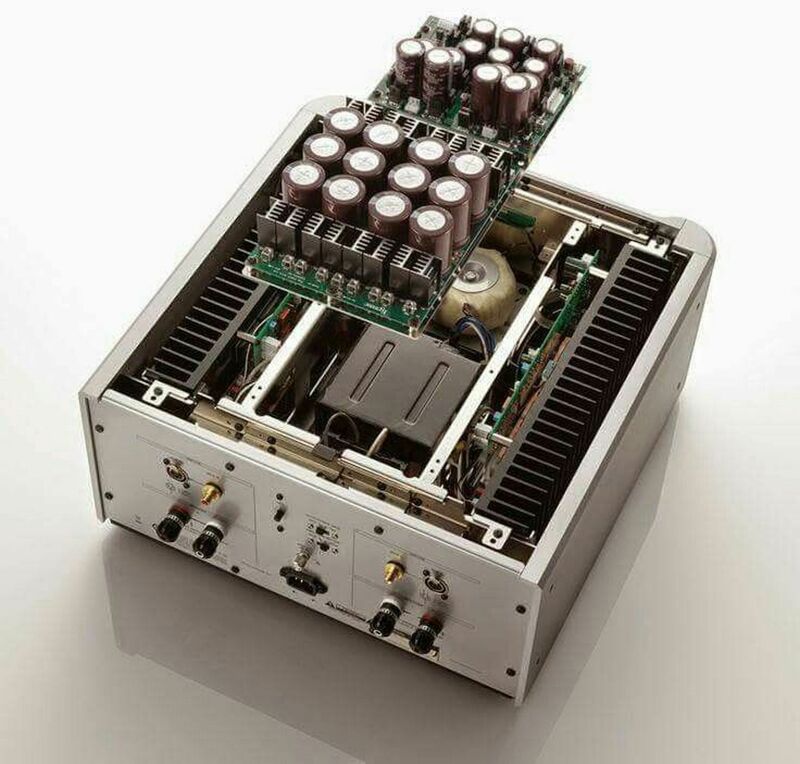 Proudly taking its place as a new reference boasting Grandioso lineage, the S-02 utilises the know-how and technology employed in Esoteric’s premier monoblock M1 and stereo S1 power amplifiers to offer generous power and exceptional dynamics that propel musical crescendos to breathtaking heights. The S-02’s outstanding performance and unsurpassed clarity allow the listener not only to hear the music, but also to feel the music, by helping to reproduce the emotion that is the essence of an involving musical experience. Audio expression, symphonic beauty, artistic passion, the concert hall’s spatial feel, the excitement of the audience. 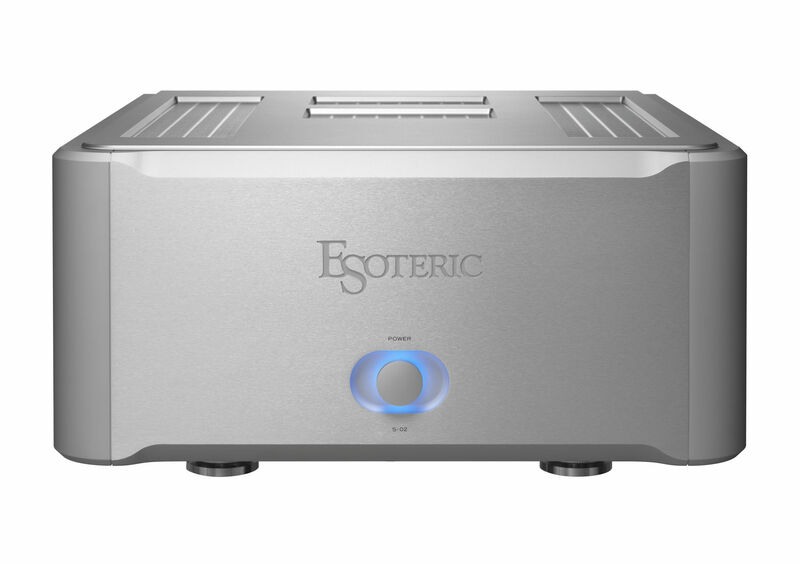 Esoteric’s Master Sound Works is an audio product concept that recreates all of the music information in original master recordings with the most state-of-the-art technology available today. The indescribable feeling of spaciousness that comes when sound is truly unleashed and the sense that the music you’re hearing is truly live, can only be generated by amplifiers that offer abundant power to properly drive the loudspeakers. 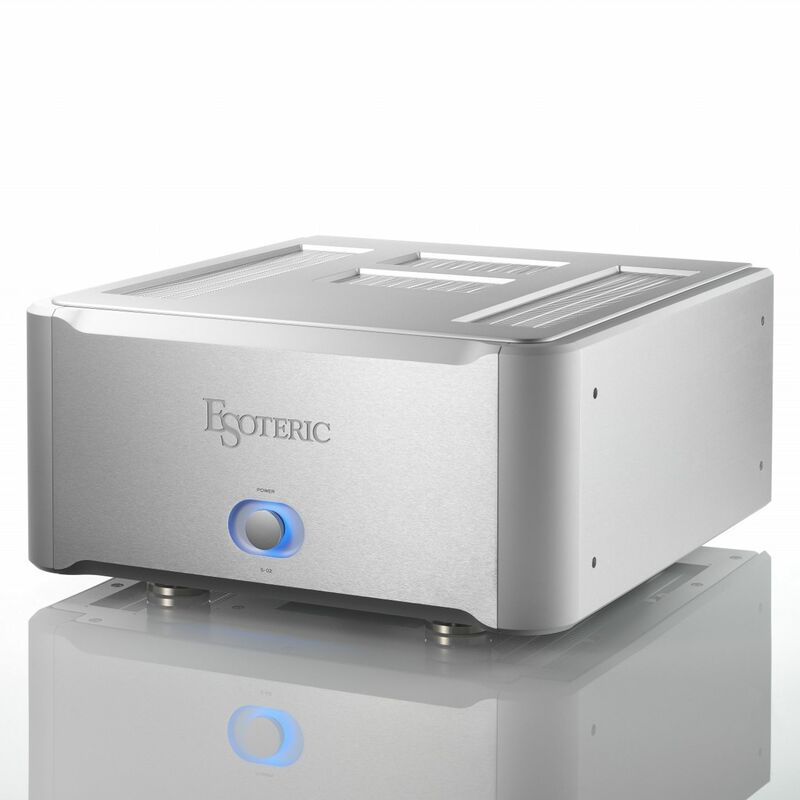 Esoteric’s amplifiers use the finest components and massive power supplies to achieve the high output power this demands. Faithfully incorporating the design philosophy of our Monoblock M1 amplifier, the new S-02 sets free every nuance of sound, and imparts to music all the vibrancy and richness of life. Loudspeaker impedance can vary widely depending on the frequencies being reproduced. The fast attack of deep bass imposes demanding loads on an amplifier, requiring not only continuous high power output, but also repeated bursts of peak power. Unless the amplifier’s power supply is capable of consistently meeting these demands, musical dynamics will be compromised. The S-02’s generous power supply capacity enables this nominally rated 145W into 8 ohms amplifier to deliver an impressive 580W into 2 ohms — a testament to the linearity of a power supply that faithfully reproduces the full spectrum of sound dynamics at all volume levels. A robust power supply is critical to an amplifier’s ability to deliver high power in a linear manner. This is especially true for the power transformer, so great atten- tion was paid to the material selection, is securely mounted on a rigid, 5mm-thick steel base plate. Three parallel 4,7001-F capacitors per channel shorten charge and discharge times, and provide a tighter, faster sound. Power supply wiring uses heavy-duty cables fitted with crimp terminals, which are tightly bolted together to reduce impedance to the lowest levels possible. Optimising the S-02’s loudspeaker drive capability required reducing the output impedance to an absolute minimum. To achieve this, a total of nine bus bars were used for each channel, while the output coil was eliminated. Strenuous efforts were also made to simplify the circuit design and widen its range, resulting in an exceptional damping factor of 1,000, considered a guideline for woofer drive capability. Even large-diameter woofers are provided with accurate damping for precise sound reproduction, giving an expansive feel across a wide range that reaches to even the lowest frequencies. The S-02’s audio input signal enters through discrete balanced input buffer amplifiers and is relayed to the amplification stage by way of a balanced low-impedance signal path. An outstanding dynamic range is assured by clean, noise-free signal amplification that provides the fine sensitivity needed to reproduce nuanced gradations between musical crescendos and silence. The S-02’s large bipolar LAPT* transistors are twice the size of more commonly used power transistors. They also boast an exceptional continuous current capacity of 17 amps and an instantaneous peak capacity of 34 amps. In addition, they offer superior high-frequency characteristics that contribute to accurate reproduction of subtle tonal qualities. The power amplifier module uses bipolar LAPT transistors in a three- stage Darlington configuration with five parallel push-pull sections. To realise the superior high-frequency characteristics of these devices, a simplified amplifier circuit was developed to reduce the number of components and parallel elements. To prevent large fluctuations in the drive (current amplification) stage from affecting overall sound quality, the preceding voltage amplification stage receives a low level signal from the input stage, and derives its power from a dedicated power supply equipped with its own toroidal power transformer. This isolation ensures a stable supply of power to the voltage amplification stage for greatly enhanced resolution of fine instrument details, even when reproducing full orchestral crescendos. 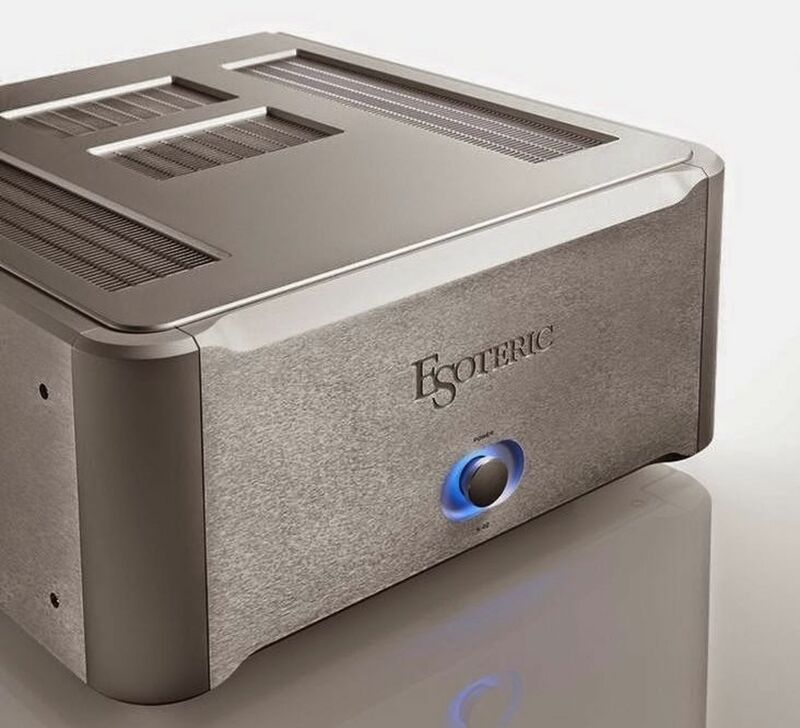 Simplifying the amplifier circuitry and reducing the previous stage’s gain results in greatly reduced Negative Feedback (NFB) for a more natural and life-like sound. The S-02 employs highly reliable XLR and RCA input connectors, and loudspeaker terminals produced by WBT of Germany. Other high-grade components include low-impedance electrolytic capacitors and transistors featuring superior high-frequency characteristics.